Review: The dry leaf is dark brown, somewhat broken and small, sparingly sprinkled with a few tips. It has little discernible fragrance when dry and doesn’t even smell like much once infused to a surprisingly light bodied copper liquor. 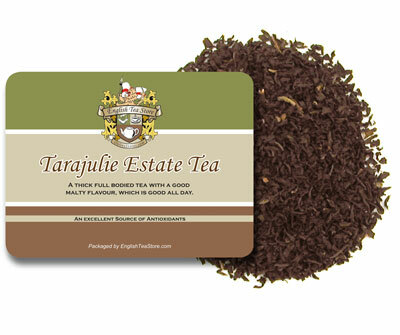 The pleasure of Tarajulie Estate Assam is all in the drinking. It’s low price ($3.89 for four ounces) made me suspicious of this tea, and I figured I’d have to soup it up with plenty of milk and sugar just to make it palatable. Instead, I took a sip and found it to be a light, tasty tea, very different from many of the inexpensive Assams currently available. This is not an intensely flavored tea, though it has some malty notes. It is slightly earthy and maybe has a faint hint of fruit (apricot?). The tea is somewhat astringent, but not so much that it makes your mouth pucker or requires any additives. My overall impression of this tea is that it is a decidedly refined Assam sold at a bargain price. Folks who want to keep a good Indian black tea in their homes that can be served at breakfast or as an all-day sipper should find Tarajulie Estate Assam to be a good choice. Preparation Suggestions: Prepare this tea with boiling water and allow to steep for four minutes to fully bring out its flavors. Unlike many Assams, it doesn’t need milk to smooth out rough edges, though I did try it with a splash of vanilla-flavored, unsweetened almond milk and found that preparation to be very good. Food Pairing: This works fine on its own, but I strongly recommend it with traditional breakfast foods, such as bacon and eggs, or with a sweet snack or dessert. Not overpowering, but astringent enough to cut any grease or sticky-sweetness, leaving the palate refreshed.